Kind of a short and sweet one today...a recent layout I created for the Bo Bunny blog using the new Olivia collection! I have to admit I have completely fallen in love with this new line, but really that are all gorgeous! On this layout I used the some of the new wraps. Can you spot it? It is the green border along the left hand side! Now look at it a bit closer...do you see anything? Yep, you guessed it! 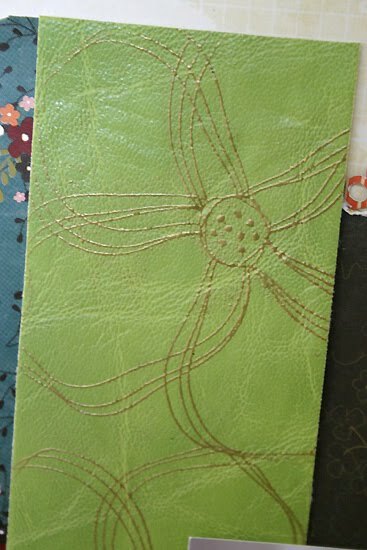 I heat embossed on it using the large flower in the Olivia Clearly stamp set. Doesn't it add a nice touch?! 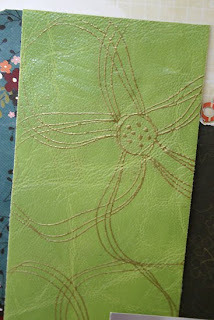 And 0f course, I had to add some flowers, which are all hand cut from the paper and then layered for more dimension. And that gorgeously delicate looking border around the photo is a digital die cut called Lace Borderlines by Laina Lamb and you can find it here! This LO was created with special thoughts for my hubby cakes as we are coming up on our 5 year anniversary in September! I am so very grateful for him and all we have together! I love you baby!!! Thanks for stopping by and reading the last little bit of mushiness and not getting totally grossed out! This is my new favotrite layout of yours Juliana, and I like mushy!! This is sweet and oh so pretty!!! What a beautiful pic of the two of you. Happy anniversary (alittle early). I LOVE it! Mush and all!! Congrats and great job on a fabulous layout. This is my most fave line from Bo Bunny as well. This is so pretty, Juliana, and the heat embossing adds such a great touch to the ribbon. Such a cute LO and I agree, I love the new Olivia line. Really nice! Love this beautiful layout you created!! This is gorgeous, Juliana! I absolutely adore that photo of you and hubby! 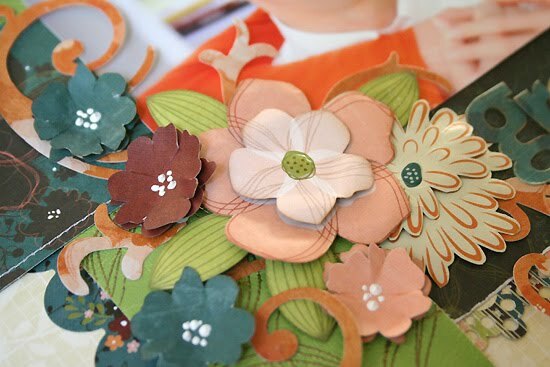 Your handcut flowers are here are stunning, and that border wrap stamped piece is so cool. This outta be framed, my friend. Such a pretty LO!! LOVE IT!! :) :) :) :) Hope you are enjoying your weekend! !